Just reading some of the comments that are made by people who have obviously not done all their research. May I please bring your attention to the London Gazette Friday, 28 September 1945 that, with a judicious bit of tweaking, I have managed to put into text below. I have not entered into this fray before but I thought that the comments about 'glory seekers' certainly in context with my father was totally out of order. In my father's last years of his life and only because I was working at the Ministry of Defence In London, did he speak to me of several things. My father was the resident engineer who changed the old Alabaster mine into a bomb dump in the Cold War period. Prior to that he had been the manager of the Fords Alabaster works and lived in Fauld Manor (I think that was a perk of the job). The transverse wall that's referred to in a lot of places as saving the other, bigger, half of the dump going up was requested by my father In the initial designs, but turned down by the air Ministry due to cost. He insisted on building it, and he always had a twinkle in his eye when he talked about it. If you have experience of underground works you will understand that a competent resident engineer would be able to make sure that a structural dividing wall he wanted was put in and no inspecting accountant would ever find it!! When the explosion happened my father was doing some work in Stornoway and he was flown straight down as an absolute top priority and was on site and put in charge of the reconstruction and recovery of explosives by early evening. This would have been quite convenient for him as my mother, my sister and myself were living at Oakley in Tutbury. I can imagine that my mother was fully aware of everything that was going on in this extended recovery procedure and she must have led a really nerve wracking experience. The wording of the London Gazette is quite 'interesting' in saying that my father assisted with the removal of the HE and that Doctor Rotter was responsible for excavating the explosive stores. Certainly procedures were lax and when you've read the whole court of enquiry (which I have done) one can understand the unrest and disquiet at the progress and reporting of things. We must remember that a war was on at the time and that the similar storage facility in Llandudno had had a catastrophic structural failure, in other words, a lot of our hardware that was essential for the bombing raids was not available. Of interest. I have all the papers from the coroner because everybody that was found had to be taken before a coroner's court to ensure that bodies were not dumped on site. You will no doubt be aware that there were a large number of Italian prisoner of war working as labourers in the underground facility on the bombs and incendiaries and there were rumours that the explosion was caused by sabotage. The court of enquiry, which was suppressed for 30 years, made it quite clear that there was no enemy action involved. I did get involved some time ago with a rather elderly guy in Australia who had a bee in his bonnet that the explosion was caused by a V1 landing at the mine. There were lots of photographs he had that looked to his eyes as though there were bits of the V1 lying around. I did try to get him to give me a copy of his website because what he said was from contemporaneous sources, but unfortunately he, I think, has died and with him all the information he had on his website. I hope that this information is of interest. There is another supplement that I have been unable to trace which makes more BEM Awards. St. James's Palace, S.W.1. 2nd October, 1945. 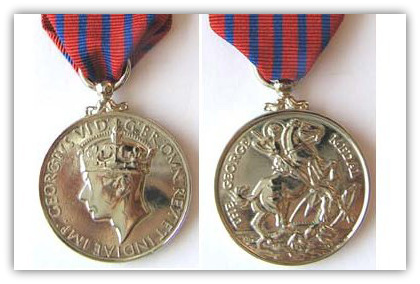 The KING has been graciously pleased to give orders for the undermentioned appointment to the Most Excellent Order of the British Empire, for the following awards of the George Medal and of the British Empire Medal, and for the publication in the London Gazette of the names of the persons specially shown below as having received an expression of Commendation for their brave conduct. Sydney Walter MAXTED, B.Sc., A.R.C.S., Scientific Adviser, Ministry of Supply. Eric BRYANT, Resident Engineer, No. 21 Maintenance Unit, R.A.F. Godfrey ROTTER, C.B., C.B.E., D.Sc., Scientific Adviser, Air Ministry. George Edward Fox, Leading Storeman, No. 21 Maintenance Unit, R.A.F. Ernest PARKER, Siskol Machine Operator, No. 21 Maintenance Unit, R.A.F. Horace William UTTING, Quarryman, No. 21 Maintenance Unit, R.A.F. An explosion of great violence occurred at an underground bomb storage depot which consisted of two adjacent mines. The explosion took place in the smaller mine, but its effects were seriously felt in the larger mine where large quantities of explosives were stored. While the greater part of this mine had not suffered serious structural damage, there was a substantial portion of it in which serious roof falls had occurred. The conditions were dangerous in the extreme. Large quantities of rock had fallen on the stored shells and further falls were threatened. Various highly sensitive explosives were mixed up with the debris so that every step in the clearance operations had to be taken with the utmost caution and there was serious risk of a further explosion. Eric Bryant was placed in charge of the structural restoration work within the mine and he also assisted in the removal of explosives. He was the first to enter the damaged portions of the mine and his work required him to crawl on top of falls overlying explosives in a dangerous state and to walk and crawl under roof which was liable to fall. His untiring efforts and quiet confidence, combined with his skilful judgment, inspired all concerned to carry on with the dangerous work. Dr. Rotter was responsible for evacuating the explosive stores. A further explosion would have caused extensive damage, since a natural protecting traverse had been destroyed. The methods to be employed in the evacuation were left to him and in the final stages a small selected band of volunteers worked under his personal direction. Dr. Rotter's example was outstanding and his enthusiasm for the work, the risks of which he fully appreciated, was inspiring. He displayed courage of a very high order and this, together with his skilful direction, gained for him the complete confidence of the men. Maxted and Fox led a small party engaged in the precarious work of recovering damaged explosives. In certain areas of the mine considerable quantities of specially dangerous stores had been blasted from their containers and intermingled with debris. Great care had to be taken as it was not known whether the safety devices of -certain of these damaged stores were still intact. The two men showed courage without regard for their own safety. Parker and Utting shored up bad roof with timbers to prevent falls and had to do this before other parties could start on the work of removal. The utmost care had to be taken not to dislodge roof which might have fallen on explosives with disastrous results. Parker and Utting worked fearlessly and, by their example, helped to maintain the morale of others. Robert Stacy WILSHER, Inspector, British South African Police. For services to the Forces during military operations in the Aegean and Dodecanese. Edward Malcolm ANDREWS, Foreman of Trades. George Henry CLOWES, Leading Storeman. William Henry GREEN, Quarryman-Leading Hand.